The New Horizons team, working with astronomers using some of the largest telescopes on Earth, will begin searching this month for distant Kuiper Belt objects that the New Horizons spacecraft hopes to reconnoiter after completing its observations of the Pluto system in mid-2015. No spacecraft has ever visited the Kuiper Belt, a distant, donut-shaped region of the solar system filled with small planets and comets that formed early in the solar system’s history. Diagram of the Kuiper Belt, beyond the orbit of Neptune, more than 3 billion miles from the Sun. 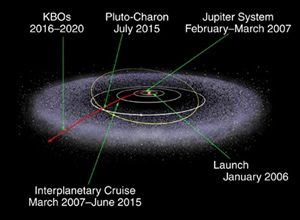 Pluto's orbit in the Kuiper Belt is shown in yellow; the trajectory of the New Horizons spacecraft is shown in red. While the main target for NASA’s New Horizons mission is Pluto and its three moons, New Horizons was built with post-Pluto Kuiper Belt object (KBO) flybys in mind. Spencer cites two reasons why suitable target KBOs aren’t already known. First, they are likely to be more than 10,000 times fainter than Pluto — near the very limit of what large telescopes can detect. Second, by a twist of fate, the current location of objects that New Horizons can reach is superimposed on the dense star fields of the Milky Way’s center, in the constellation Sagittarius, which is the hardest region of the Kuiper Belt to search for faint KBOs. To conduct the KBO search, the New Horizons project has recruited an international team of astronomers from nine institutions in the U.S., Canada, France and Chile, which has secured 140 total hours of observing time between April-July 2011 on some of the world's premier telescopes, including the 8-meter Subaru and 3.6-meter Canada-France-Hawaii telescopes at Mauna Kea Observatory in Hawaii, and the twin 6.5-meter Magellan telescopes at Las Campanas Observatory in Chile. 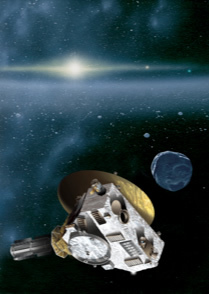 In this artist's concept created by Dan Durda of SwRI, New Horizons flies by a Kuiper Belt object. 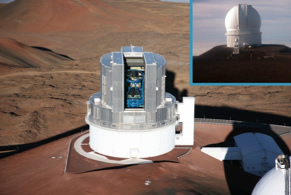 During the search, which begins later this month, these telescopes will take thousands of wide-field images, containing millions of stars. The search team will then sort through this mass of data to find a few moving points of light, with orbits in the Kuiper Belt. After follow-up observations next year to refine the orbits of these flyby candidates, one or two of them may become a New Horizons target.